I’ve been doing a bit of bread baking recently and always end up with 2 loaves. One of the loaves is usually eaten quickly while the second languishes a bit and gets stale. It’s not surprising. Fresh bread is fantastic, two day old bread is meh. What do you do with the re-meh-ning bread? Probably the oldest method of not letting your stale bread go to waste is to use it in soup. 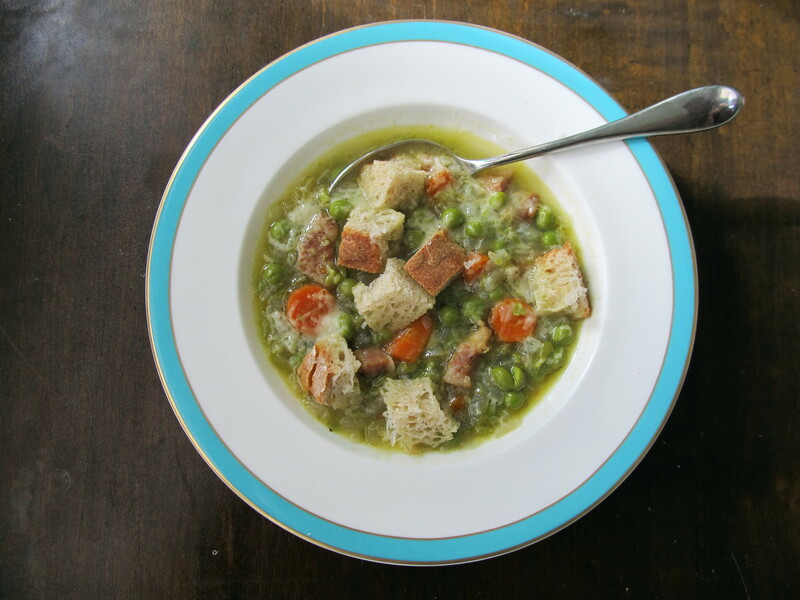 I found a good recipe for leftover bread in Carol Field’s Italian Baker; Florentine onion and pea soup. Of course, I made a few changes. As far as pea soups go this is far from the thick as London Fog pea soup you’re used to. Even though the bread thickens the soup up a little it’s much lighter and the flavors are sweeter. Part of the reason is because you use whole peas in the soup and not split peas so it doesn’t have a fully pureed soup consistency. You puree only half of the peas which gives a nice color and body to the base while the remaining whole peas add some extra texture. This soup will be excellent in the spring when you can get your hands on fresh early peas but even with frozen peas it’s very tasty. There’s nothing complicated about it either. If you’ve got some stale bread and a bag of frozen peas in the freezer (as you probably always should) you can whip this soup up in no time. It’s great for a light weeknight dinner or weekend lunch. I think the soup may benefit from a little bit of acid like some vinegar or lemon and maybe some herbs but it’s a minor quibble. I altered the recipe a little bit and think the changes work. In my opinion pea soup needs some ham or something salty in it to counteract the sweet so I added some of my home cured guanciale to the initial mix. Without the guanciale this would make a good ‘Meatless Monday’ dish if you do that sort of thing. Also, I changed out some onion for shallots and increased the amount of liquid used. Originally the recipe called for 2 cups of chicken broth which I thought wouldn’t make much of a soup, so I doubled it and used water instead of broth in order to taste the vegetables. And by adding more water we ended up with just enough to have leftovers the next day and use up some more of that old bread. Heat the olive oil in a large pot over low heat. Add the guanciale and cook for a few minutes. Next, add the onions, shallots, celery, and carrots. Season with salt and pepper. Cook uncovered on low heat for 90 minutes, giving them an occasional stir to keep from sticking. They shouldn’t burn since the water released from the onions will keep them from sticking but give them a stir once in a while anyway. Puree 1 C of the peas in a food processor or blender. Set aside. After slow cooking the vegetables for 90 minutes pour in the water, turn up the heat to medium high and bring to a boil. Reduce to simmer and add the 1 C of whole peas. Stir in the pureed peas. Adjust the seasonings. Soup is ready when the peas are cooked. I like to cube the stale bread, though depending on your bowl you may want to grill or toast a larger piece. Place the slice of bread in the bottom of a soup bowl and ladle the soup on top. Grate some parmigiano reggiano over the soup to finish.